A game-winning field goal last Sunday was a long time coming. BALTIMORE — Johnny Townsend jumped with both arms raised, signaling “good” two seconds before the back judge and field judge standing beneath the goal post confirmed. 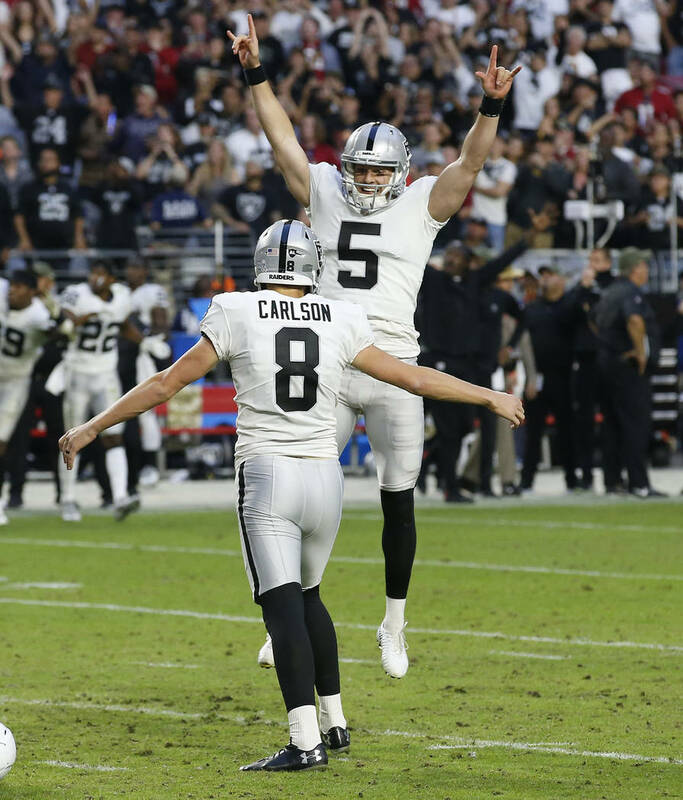 The Raiders’ punter and holder then crashed helmets with kicker Daniel Carlson, the two hugging to celebrate a 35-yard game-winning field goal as time expired. Last Sunday’s kick, which snapped a five-game losing streak, was a long time coming. Not just for the Raiders. Townsend and Carlson first met at age 14 in early 2010 at an invite-only football camp in Orlando, Florida. A friendship formed, and the two kept in contact over the years, seeing each other at various camps and showcase events. Improbably, the rookie specialists have intersected again as NFL teammates, a dynamic that will continue Sunday against the Baltimore Ravens. On Oct. 23, Carlson worked out and signed with the Raiders. His holder at the tryout was no stranger. “I’ve pretty much been through every step of Daniel’s journey,” said Townsend, who held some for Carlson this summer during offseason training. “We met each other when we were freshmen in high school at a Kohl’s kicking camp, and we became friends at that camp. Ever since then, we’ve stayed in touch through the years, through our high school recruiting process, through our college careers and even through our NFL careers. That they’re now teammates at age 23 is an unlikely development. In April, the Minnesota Vikings were antsy to address their kicking issue, trading into the fifth round and selecting Carlson out of Auburn. He was the first kicker to be drafted. In September, the Vikings were antsy again. Carlson struggled during a Week 2 tie with the Green Bay Packers. 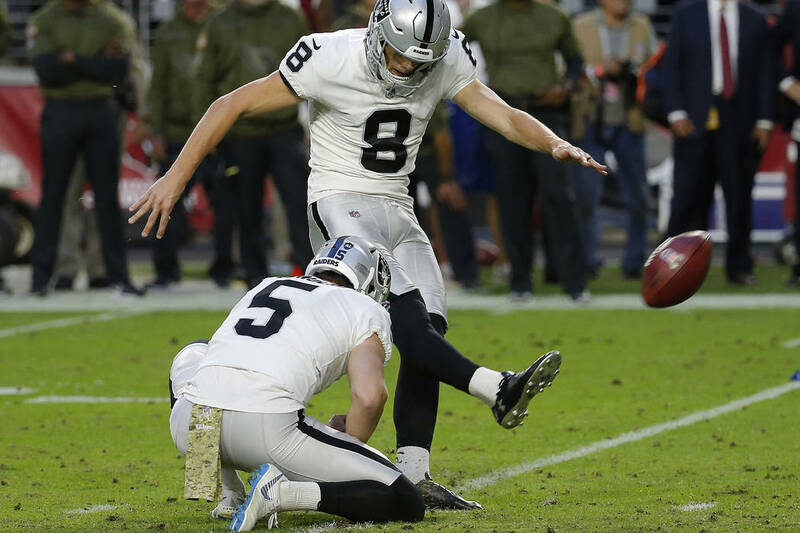 He missed a 48-yard field goal in regulation, a 49-yard field goal on the opening drive of overtime, and a 35-yard field goal — the same distance he converted last Sunday— as overtime expired at Lambeau Field. Minnesota waived him the next day and signed veteran Dan Bailey. Carlson then faced life as an free-agent specialist. Before the Raiders called, he worked out for the Cardinals, New York Jets, Cleveland Browns and Los Angeles Chargers. “Obviously, it’s frustrating,” Carson said of his career start, “but I knew in the back of my mind I was always going to get another opportunity. I knew I had the talent. I knew I was capable of playing in the NFL. I didn’t know when it was going to happen. I didn’t know how it was going to happen. You had to be a little patient sometimes. That’s where the faith pays off. That led him to Oakland. The entire kicking operation here — Townsend, Carlson, and undrafted rookie Trent Sieg —is composed of first-year players. A friendship exists between all three, as they often spend time together when in the Bay Area or on the road. On Thursday, they dined together at quarterback Derek Carr’s home for Thanksgiving. After a 1-4 start in Minnesota, Carlson is 6-for-7 on field goals. He has a longtime friend with whom to celebrate.